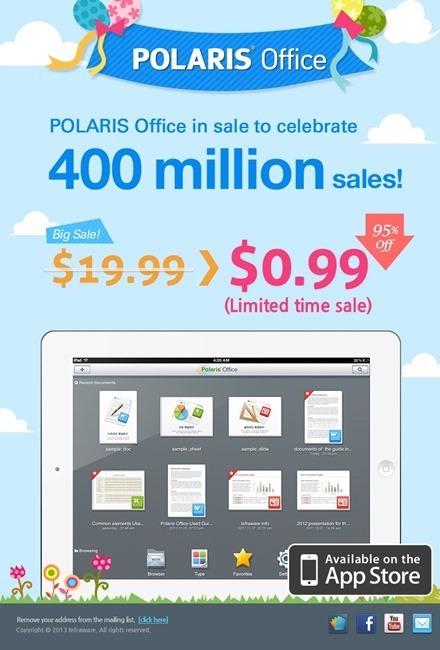 Polaris Office is a good looking iPad app that lets you view and edit Microsoft Office and PDF documents. In the absence of official Office apps for the iPad, this is an app that can help to fill the void. And today it’s on sale at a huge 80% discount – down from it’s standard $19.99 to just 99 cents. A few months ago I wouldn’t have been a a candidate for trying this app out, as I just had very little need to work with Office docs. Now that I’m back at work as an IT Consultant, this sort of iPad app is a near essential for me again. I bought Polaris Office yesterday and so far it’s working well for me. 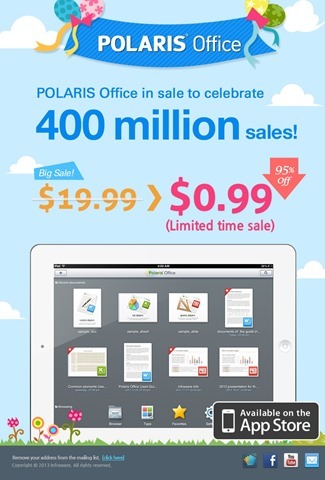 Here’s an App Store link for Polaris Office; it’s a universal app designed for both iPad and iPhone.